Infused with Vitamin E and antioxidants, this lightweight UV protective foundation provides buildable coverage, anti-aging benefits and a radiant natural finish. 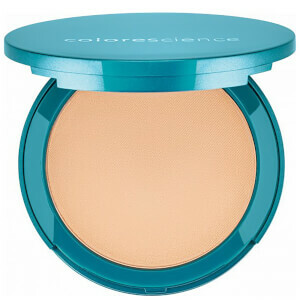 Apply using Colorescience kabuki brush for medium to full coverage. Apply with brush in tight circles for a full finish. Large, sweeping circles will provide a medium finish. Active ingredients: Titanium Dioxide 21.2%, Zinc Oxide 12.1%. Inactive ingredients Mica, Ethylhexyl Hydroxystearate Benzoate, Tocopheryl Acetate, Daucus Carota Sativa (Carrot) Seed Oil, Glycerin, Methicone, Dimethicone, Triethoxycaprylylsilane, Lycopodium Clavatum Extract, Imperata Cylindrica Root Extract, Lauroyl Lysine, Silica, Pelargonium Graveolens Flower Oil, Cananga Odorata Flower Oil, Fusanus Spicatus Wood Oil, Phenethyl Alcohol, Sodium Dehydroacetate, Caprylyl Glycol, Phenoxyethanol, Potassium Sorbate, Citronellol, Farnesol, Linalool, Bismuth Oxychloride (CI 77163), Chromium Oxide Greens (CI 77288), Iron Oxides (CI 77491, CI 77492, CI 77499).